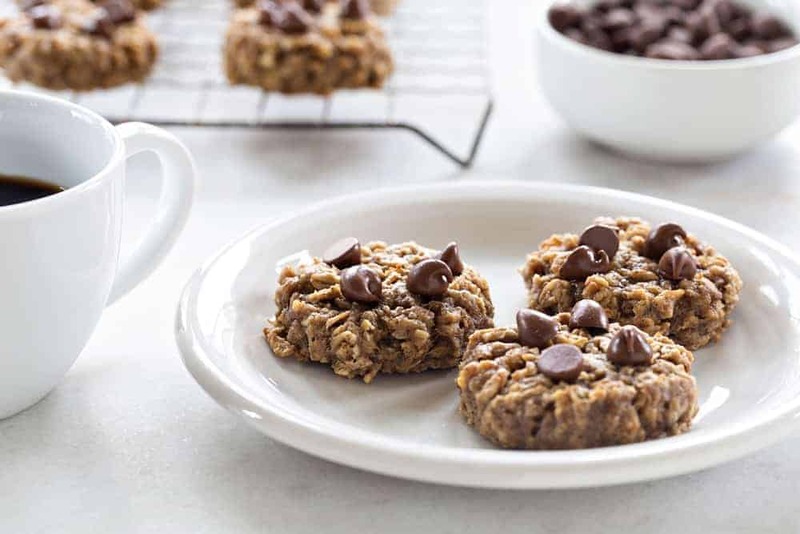 Banana Oatmeal Cookies are soft, chewy and studded with chocolate. Pair them with a mug of your favorite coffee for breakfast, or serve them up for dessert! Today I want to chat about Kombucha. Which is obviously completely unrelated to these Banana Oatmeal Cookies, but I know you won’t mind. Let me start by saying that my husband drinks apple cider vinegar mixed with water every morning to reduce inflammation or something like that. He claims it’s magical. I claim it’s nasty. While I know this is going to seem dramatic (because it is), I literally dry heave at the sight and smell of his morning ritual on a daily basis. He loves that about me. Based upon this reaction, one would think that I would stay far away from Kombucha, right? I mean, after all, it definitely has a vinegary tang. However, for whatever reason, I keep trying it. I want to like it SO DANG BAD. I’m literally a marketer’s dream because every single time I see someone I know enjoying a sip, or touting their favorite brand and flavor with a boomerang on Instagram, I’m all, “Maybe that one will actually taste decent!”. Just imagine me using air quotes around the word enjoying because I find it hard to believe this stuff is really enjoyable in any sense of the word. And spoiler alert. None of them taste good. None. I’m basically convinced that anyone who drinks this fermented tea stuff has zero taste buds, or seriously funky ones. I have literally tried every single brand that my local market carries and I HATED, not disliked, HATED every single one. Yes, I know hate is a very strong word, but there is really no other way to describe my feelings towards kombucha. And I just had to tell y’all my true feelings on this one. Who’s with me? Believe me, I so want to enjoy the stuff because it apparently has a ton of health benefits, but I’ll be the girl sipping a La Croix and reserving vinegary flavors for salad dressing. Thank you very much! Let’s completely switch gears. One thing I always love? Cookies. 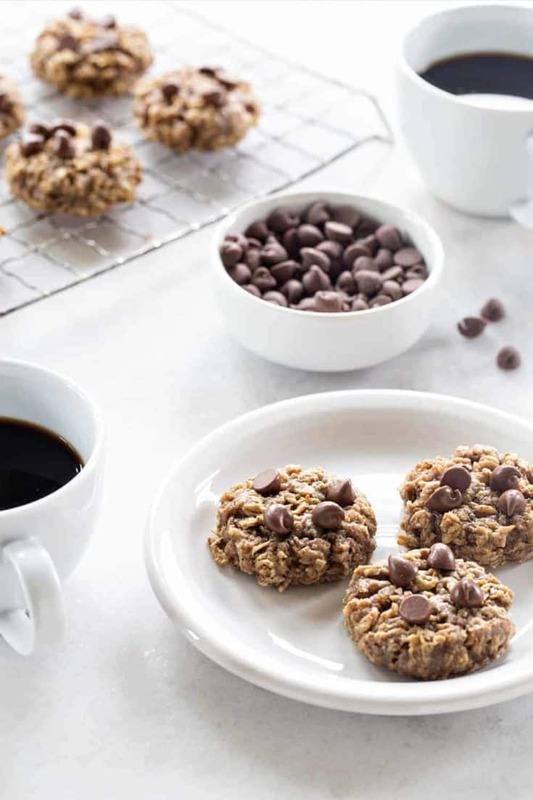 From no bake cookies and easy sugar cookies to these banana oatmeal cookies, it’s been a love affair that’s gone on here at MBA for nearly a decade now. If you are looking for easy, these peanut butter cookies are just the ticket. While I am not claiming these banana oatmeal cookies are the least bit healthy (because hello sugar and butter), I am claiming that they are delicious. 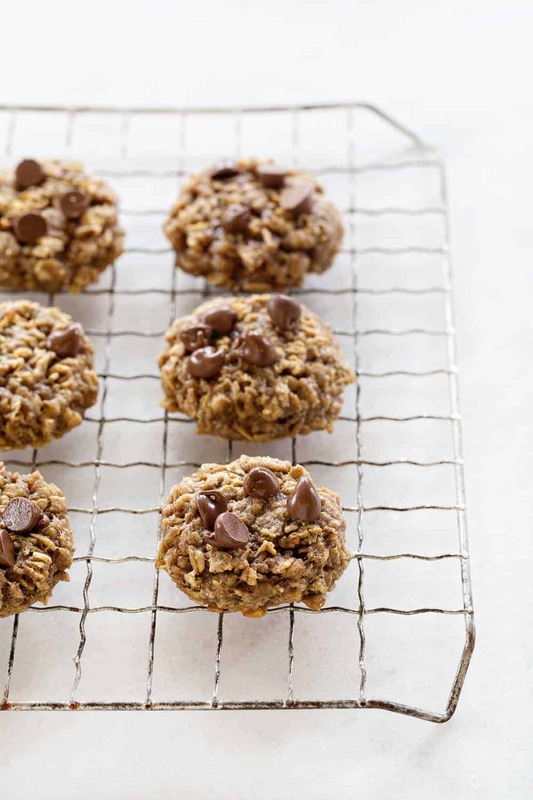 They have the perfect amount of banana flavor and a lovely chewy texture thanks to the oats. The chocolate chips are just an added bonus. Everyone who tried these banana oatmeal cookies thought they tasted a lot like banana bread, but obviously with an entirely different texture. We dug it around here. And in my opinion, they’re great a great alternative to traditional banana bread. 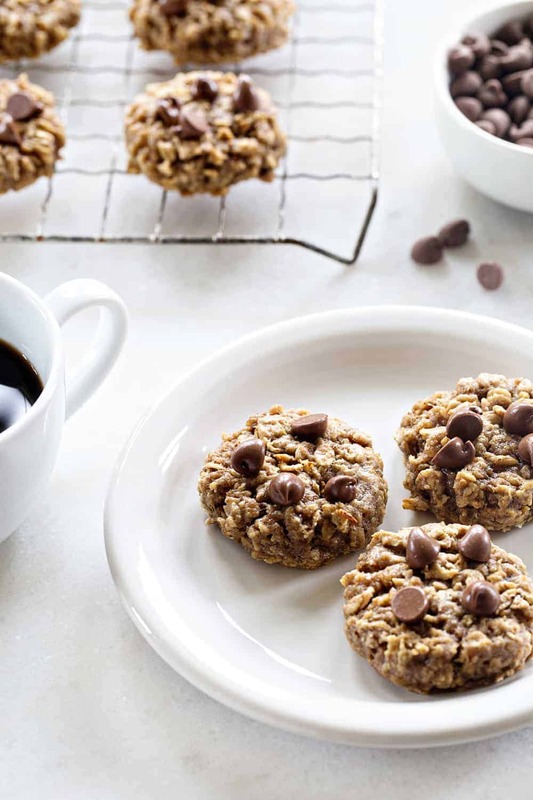 These Banana Oatmeal Cookies have a soft, chewy texture. 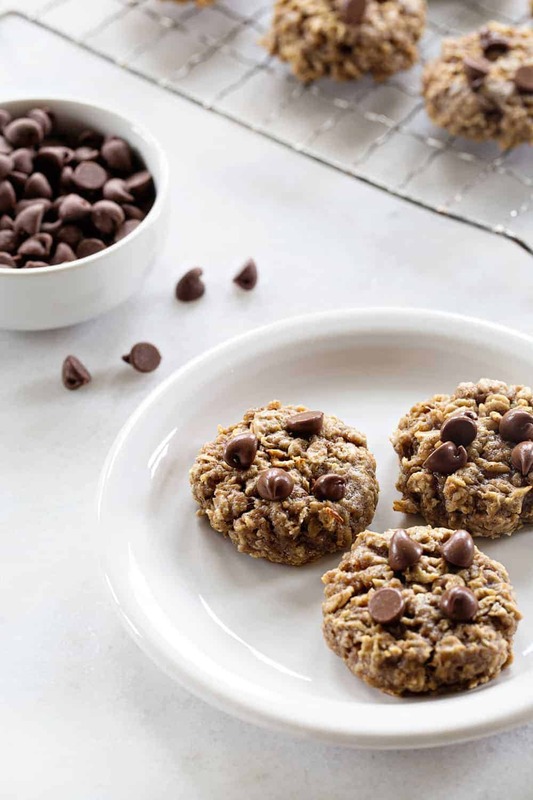 If you’re looking for a traditional oatmeal cookie, this is not the cookie you’re looking for. But you should definitely check out my Homemade Oatmeal Cream Pies and these Oatmeal Raisin Cookies. If you’re not a fan of oatmeal cookies my favorite chocolate chip cookies, might just become your new fave. I like these cookies a little on the undercooked side, so I bake them for 9 or 10 minutes. If you prefer them to be cooked through, I’d shoot for 10-11 minutes. 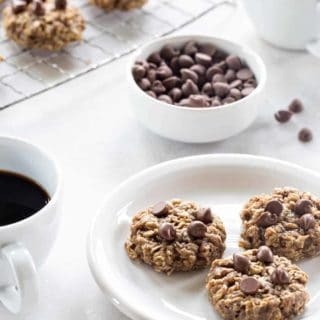 I will say that the oats almost makes them seem like a breakfast cookie, so they are all kinds of amazing with a cup of coffee or tea first thing in the morning. I did add some chopped walnuts to a batch instead of chocolate chips, but everyone definitely preferred the chocolate chips over the nuts. My friend Amber would ask, “¿por que no los dos?”, which apparently means “why not both?” (She’s from Texas, so I trust that she’s accurate), and you can absolutely do that too. These cookies are a fantastic way to use up those super ripe bananas sitting on your counter right now. I won’t even tell anyone that they’re not really breakfast cookies. Enjoy! In the bowl of a stand mixer fitted with the paddle attachment, or in a large bowl with an electric mixer, beat the butter and sugar until light and fluffy, about 3 minutes. Scrape down the sides of the bowl and mix in the egg until fully incorporated. Scrape down the sides of the bowl again and add in the mashed bananas and vanilla. Gradually add the the flour mixture to the banana mixture and mix until just combined. Scrape down the sides of the bowl and stir to recombine. Stir in the oats and chocolate chips and mix until incorporated. Use a medium cookie scoop (about 1.5 tablespoons) to scoop the dough onto prepared cookie sheets leaving about 2 inches between each cookie. Remove cookies from the oven and gently press the tops of each cookie with the bottom of a drinking glass. Since these cookies don't spread much, this will help give them a traditional cookie shape. Allow the banana oatmeal cookies to cool on the cookie sheets for 5 minutes before removing them to a wire rack to cool completely. I have heard of making your own, but I just don’t think I’d end up liking that so much. I’ll have to research it a little more! Thanks so much for stopping by! Ginger kombucha in Moscow mule! These cookies look so delicious! I have 2 ripe bananas I was wondering what to do with and then you came up with this recipe! Definitely gonna make them tonight! I hope you love them as much as we do, Natalie! I’m so with you on the vinegar situation. It’s great for salad dressing and cleaning. Period. Full stop. Just made these this afternoon. Delicious! And of course with oatmeal, totally healthy :) Thanks for the recipe. So happy you enjoyed them, Suzanne! Thanks for stopping by and leaving your feedback! Happy Baking! Can you tell us where you got the freeze dried strawberries? You can find freeze dried strawberries at most grocery stores. They are typically near the dried fruit. followed the recipe exactly… AWESOME! These cookies are super soft and the hint of banana in a cookie is a sweet surprise. I used MINI chips to max out the chocolate factor in each cookie, but still held to the suggested measure of one cup. LOVE THIS RECIPE!!! FAMILY LOVES THIS RECIPE!!! Making it again, right now. KEEPER. Yay! So happy to hear you enjoyed the cookies! Thanks so much for stopping by and leaving your feedback. Happy Baking! These were amazing cookies. Is there a preferred way to store? I’m thinking fridge but wasn’t sure if room temp was okay. Also I have not tried Kombucha cuz I don’t find it appealing and will prob detest it lol so good for you for trying!! Thanks so much for stopping by, Kathleen! I do not have the nutrition facts for this recipe. Happy Baking! Thanks so much for stopping by, Monica! I appreciate you taking the time to comment. Happy Baking! The flavor was amazing- like a slightly chewy banana bread! I missed the note about these being soft and not a traditional oatmeal cookie texture and kept rereading the recipe trying to figure out what I did wrong to end up with such fragile cookies! They were definitely a messy treat for a 2 and 4 year old. Also- make sure you use the parchment paper or a silpat! I have great nonstick pans so I always skip the lining, and these stuck to the pan a bit. Super soft cookie + prying off the pan = a few broken cookies I had to eat off the cookie sheet! Thanks so much for stopping by, Macy! I appreciate you taking the time to comment. Happy Baking!